A panel discussion on the relationship between gender and food insecurity. 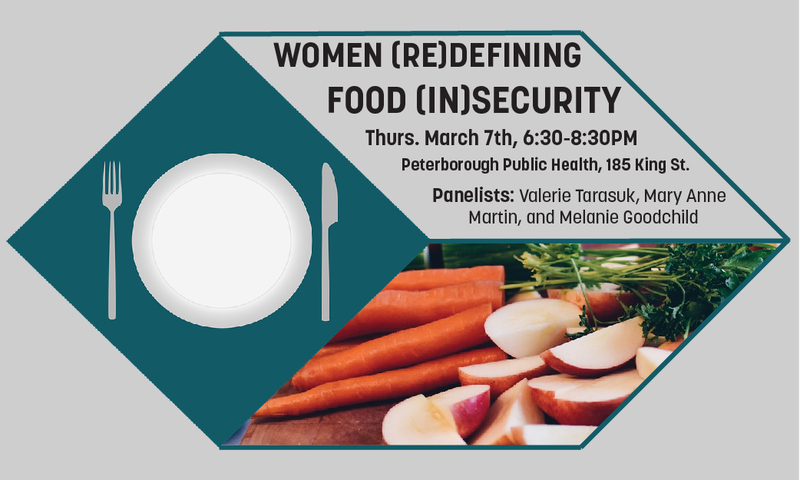 Women (Re)Defining Food (In)Security will be moderated by Peterborough Public Health's Carolyn Doris, Registered Dietitian and Manager of Family and Community Health. Valerie Tarasuk is a Professor in the Department of Nutritional Sciences at the University of Toronto, and the Principal Investigator on this research program. Val’s research extends to Canadian food policy and population-level dietary assessment, but her primary focus is food insecurity. She has worked to elucidate the scope and nature of this problem in Canada, and examine policy and programmatic responses. Her recent work includes studies on food charity, community programs, and analyses of population survey data to elucidate the health, nutritional, and socio-demographic correlates of household food insecurity in Canada. Mary Anne Martin is a feminist food systems researcher and advocate. She is completing a post-doctoral fellowship at Carleton University with Nourishing Communities: Sustainable Local Food Systems Research Group. This work focuses on the impacts of small community-based food organizations that prioritize social or environmental goals. In June, she earned her PhD from Trent University where she focused on the household food practices of Peterborough mothers living on low incomes and the ways that local community-based food initiatives may help to support them. Her work has been greatly informed by ongoing participation with food systems collaboratives such as Peterborough Food Action Network (PFAN), Nourish Project, Durham Integrated Growers (DIG), and the Durham Food Policy Council. At the end of the day, she is still trying to figure out how to get her teens to eat their veggies! Melanie Goodchild is Anishinaabe, moose clan, from Biigtigong Nishnaabeg First Nation, with ancestry also in Couchiching, Aroland and Ketagaunseebee FNs. She is studying systems thinking and social innovation at the University of Waterloo where she is a PhD candidate in Social & Ecological Sustainability and a Research Fellow with the Waterloo Institute for Social Innovation & Resilience. Melanie is a senior advisor to many social change initiatives that tackle wicked problems including the Food Systems Lab and Nourish: the Future of Food in Health Care that take a complexity and prototypes approach to solution finding. As a Type 2 diabetic she is also personally active in decolonizing her own food systems.